This beautiful pinecone cheeseball has been on my to-do list since the summer! And you won’t believe just how easy it is to make. I’ve seen lots of these pinecone cheeseballs on Pinterest so I did a whole lot of experimenting to bring you the best shape, easiest instructions, and 3 scrumptious cheese ball flavors. This festive treat will be showing up on Christmas day along with a lovely spreading knife and some buttery crackers. Let’s make a pinecone cheeseball! 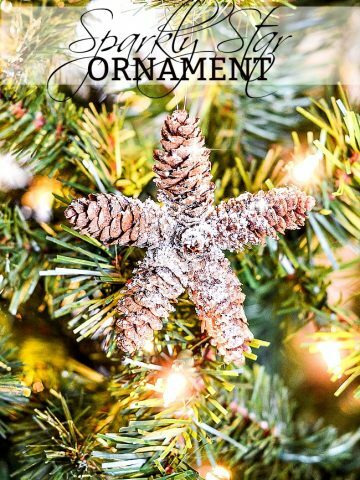 Now let’s make a pinecone good enough to eat! most of the recipes for a pinecone cheeseball out there make very small cheeseballs. 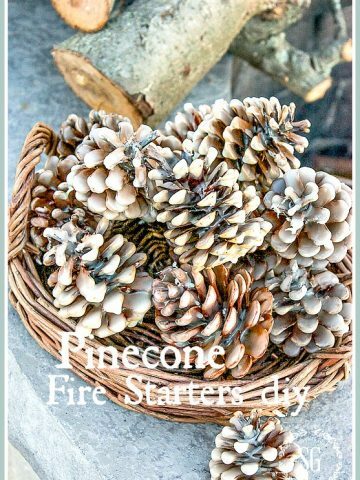 My recipe is for a nice large pinecone, one that is able to feed a group of people! shaping your cheeseball is the most important thing for a realistic looking pinecone. It should resemble a fat almond with one pointy end and the other end slightly flattened out. 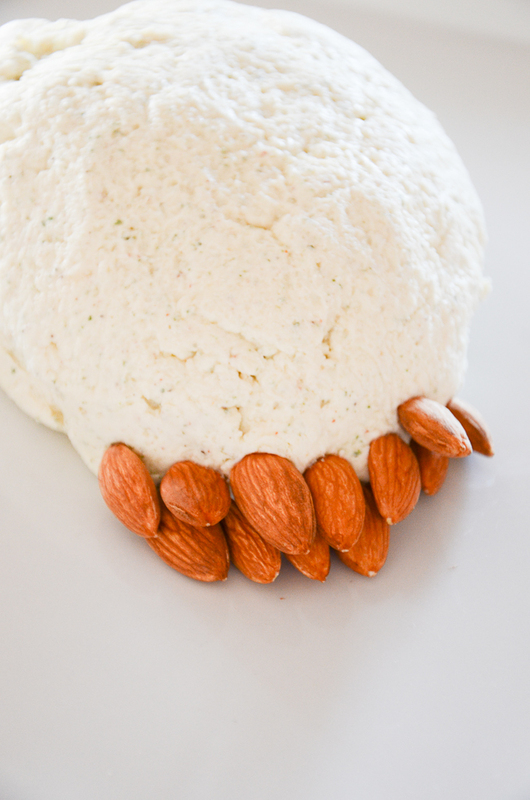 this cheeseball uses lots and lots of almonds. many recipes tell you to stick the almonds into the cheeseball at an upward angle. If you want the cheeseball to be covered and not a lot of gaps, don’t do this. Lay them almost flat against the cheeseball. this is not hard at all!!!! A WOW factor appetizer that is as delicious as it is beautiful and festive! Add everything to the food processor, except the almonds, and completely incorporate. 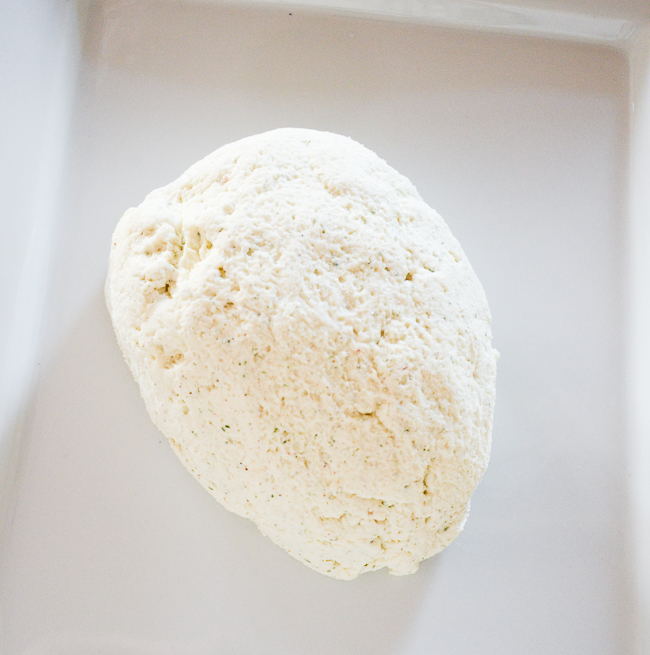 Form the cheese spread into a fat almond shape with one end slightly flattened. Meanwhile preheat the oven to 350 °. Put the whole almonds on a rimmed baking sheet. When the oven is ready bake them until just lightly browned, about 5 minutes. Cool completely. Take the cheeseball from the refrigerator, unwrap and set on a serving plate. Beginning at the tip of the cheeseball press almonds into the soft mixture starting in the front middle and working to each side. 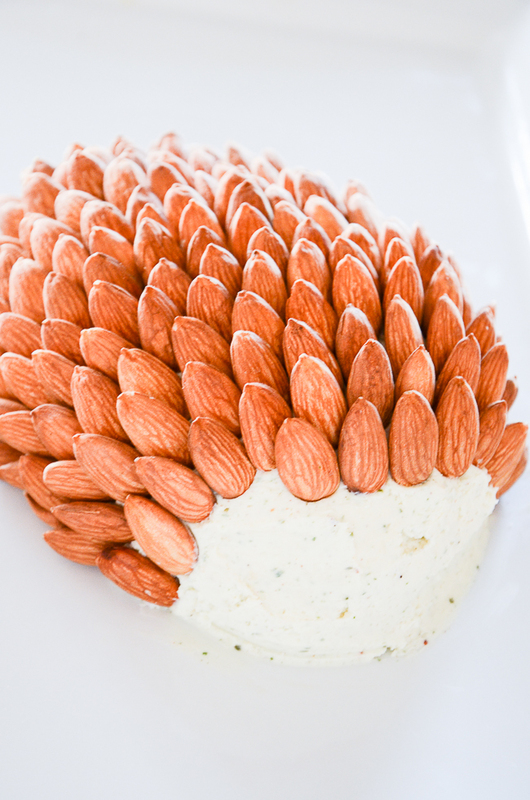 Continue until the cheeseball is covered with almonds resembling a pinecone. 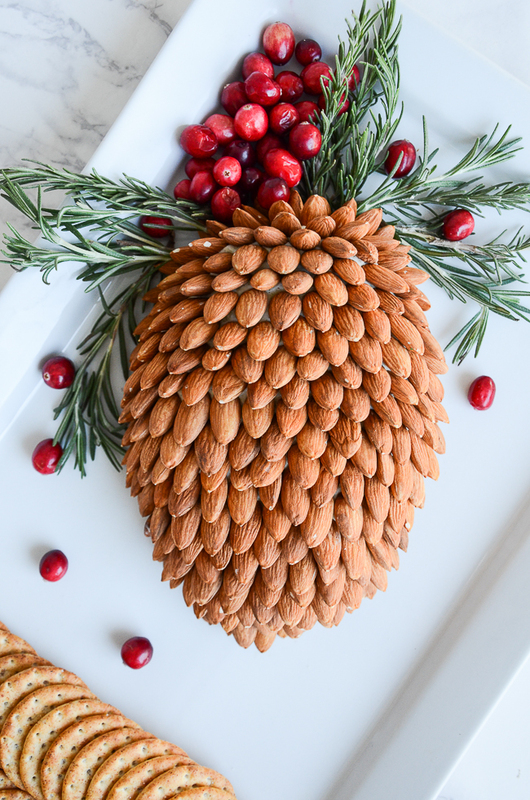 The closer you put the almonds together the better your pinecone will look. Garnish the top of the pinecone with sprigs of herbs and cranberries. To serve later, tightly cover the cheeseball with plastic wrap and put the tray with the pinecone on it into the refrigerator until ready to use. Remove from the refrigerator 30 minutes before serving. Change out the Hidden Valley Ranch mix for 1 Lipton Onion Soup mix for a cheesy onion flavored cheeseball. You still have time to make this WOW factor appetizer! If you make it send me a picture! I made this last year and completely forgot about it! I am trying the bacon and dill this time. Thanks for the suggestions! Merry Christmas!! Thanks for the recipe Yvonne. I made this many years ago and got called “Martha” a lot that night (Stewart). It is always a big hit and your recipe sounds a bit more flavorful than the one I remember. Thanks Yvonne! I’m taking one to our holiday garden club meeting. Perfect! 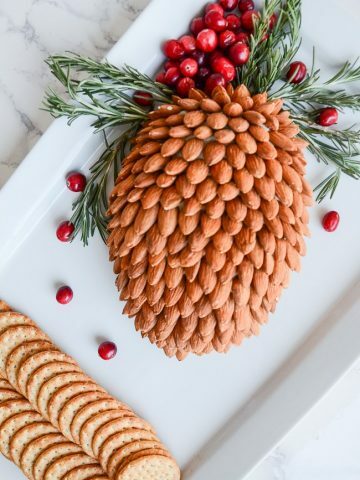 So cool, who doesn’t love a cheese ball -and one that looks like a pinecone is so cute! That is a beautiful presentation. 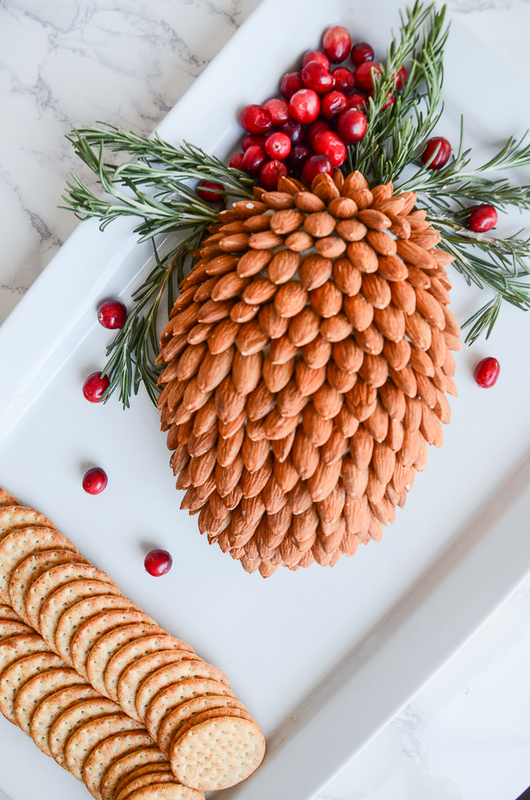 Cheeseballs are one of my favorite party foods & I love how pretty the pinecones are! Last summer I made a bacon ranch flavored cheeseball for my daughter-in-laws woodland themed baby shower. I found a sweet little white hedgehog shaped bowl & used slivered almonds for the quills. It was adorable & delicious. This pinecone would have been a perfect compliment as well. This cheeseball looks amazing! Great presentation!!! And it sounds yummy!!! Wow! The pine cone cheese ball is beautiful & the recipe sounds delicious !! 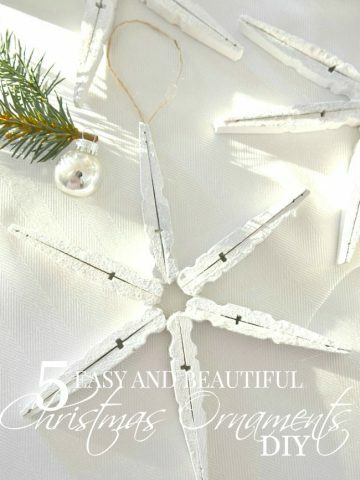 It has been added to my Christmas to do list! Thank you!! Really looks too good to eat! It is a work of food art! I have made this for the last 15 years every year for my Christmas party. I use my own cheeseball. I would send a picture but how? Looks wonderful! 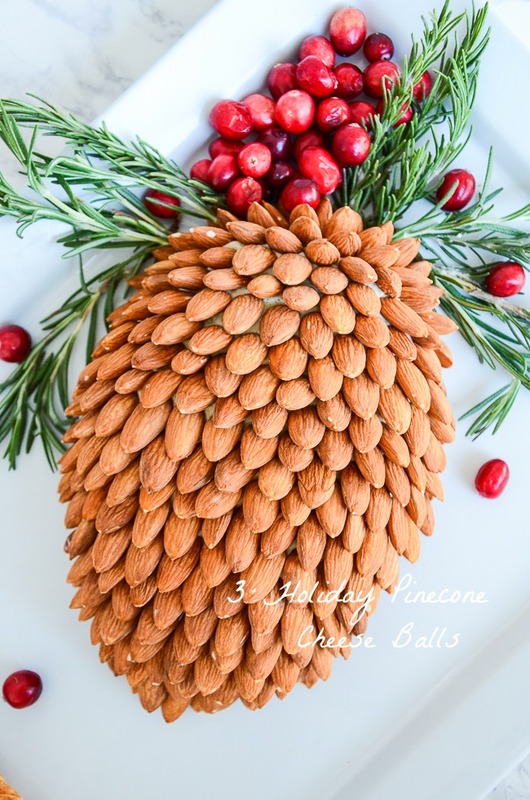 I have made pinecones my theme item this Christmas season; so what fun to include on the buffet table this Christmas and New Years. Our 5 year old granddaughter is obsessed with pinecones, maybe she will even try this cheeseball, although she is a very fussy eater. I love to see what creative ideas you have and have tried many of them, thank you for sharing. Merry Christmas! PS your recipe for gingerbread men have been a huge hit! This may sound odd to you but one of the most delicious ways to serve this cheese ball (and I’ve done this many times!) is with strawberry preserves or jam. Leave out the almonds and Ranch dressing. Make the cheese ball, make a large indention in the cheese ball and fill with strawberry preserves. Spread both on a Ritz cracker. This recipe (or something very similar) came out years ago in the 70’s. It was a fave of the Jimmy Carter family and for a long time it was on everyone’s hor d’eourve table when company was coming. Soooooo good and sooooo addictive!!! Looks great, could you serve this other than Christmas. What a presentation of a pinecone! Lots and lots of nuts, but it looks like a challenge to make. I may try this..
It’s not hard at all Phyl. Give it a try! Looks scrumptious & almonds are good nutritious! Wow, Yvonne that is beautiful and looks delicious! I will have to try that! Thanks for sharing! !